Frank is a member of the prestigious "International Guild Of Realism" and has been inducted into the Grumbacher Artist Hall Of Fame. This website shows the full scope of the varied artwork produced by Frank Wilson and promotes the Fine Art Galleries throughout the country that represent him. [See Art Galleries Page.] Frank welcomes invitations for representation from Galleries. In addition to purchasing original oils and watercolors, you can purchase CUSTOM PRINTS of selected paintings on paper or canvas in a wide variety of sizes and finishes to suit your decorating needs. If desired you can also select from thousands of frames, mats, and wrap combinations and receive your fine art prints within one week. To purchase an original painting, email me with the title and size and I will respond back with information on availability, if the painting is in my studio or what art gallery the painting is in and what the price is. Go to the "Contact" page. All content Copyright © 2018 by artist Frank Wilson. No portion of this site may be used or transmitted without the expressed permission of artist Frank Wilson. 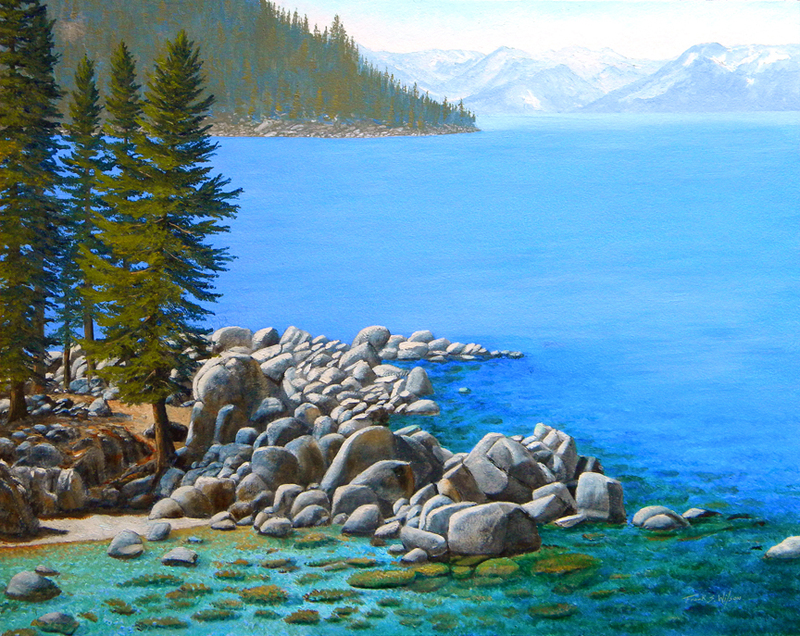 "SAND HARBOR IN WINTER ~ LAKE TAHOE"
24 x 48 inch oil painting on a frame-less 2 inch deep cradled hardboard panel with black sides. The original oil painting is available for $5,800.00 from my studio. Prints are available in stretched canvas, acrylic, polished metal and paper. Click on image to see your options. 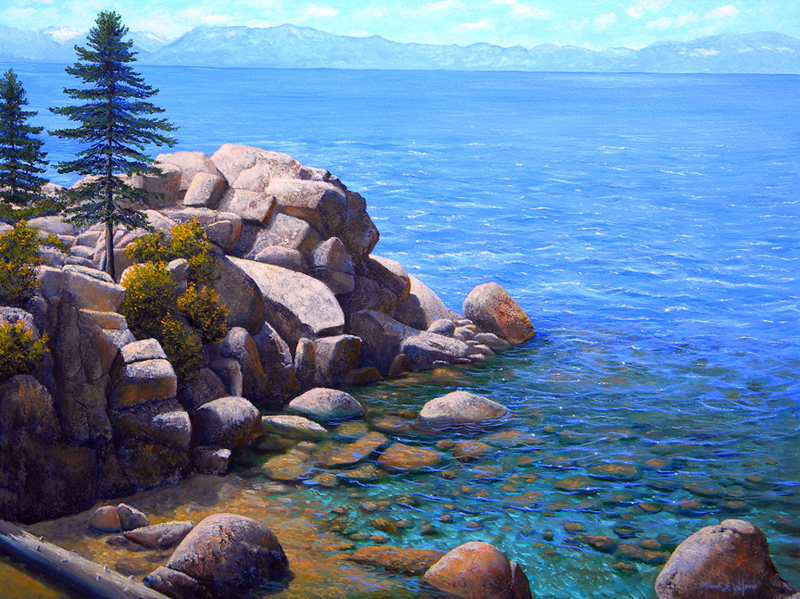 "BOULDER COVE ON LAKE TAHOE"
18x 24 inch oil painting on a frame-less 2 inch deep cradled hardboard panel with black sides. The original work is available for $2,500.00 from the Art Truckee Gallery in historic Downtown Truckee, California. 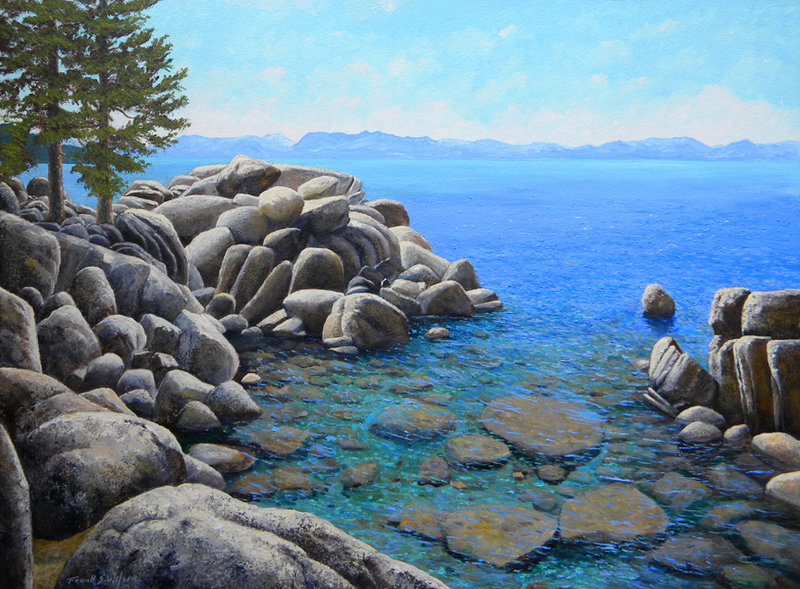 "Rocks And Water Lake Tahoe"
18 x 24 inch oil painting on a frame-less 2 inch deep cradled hardboard panel with black sides. 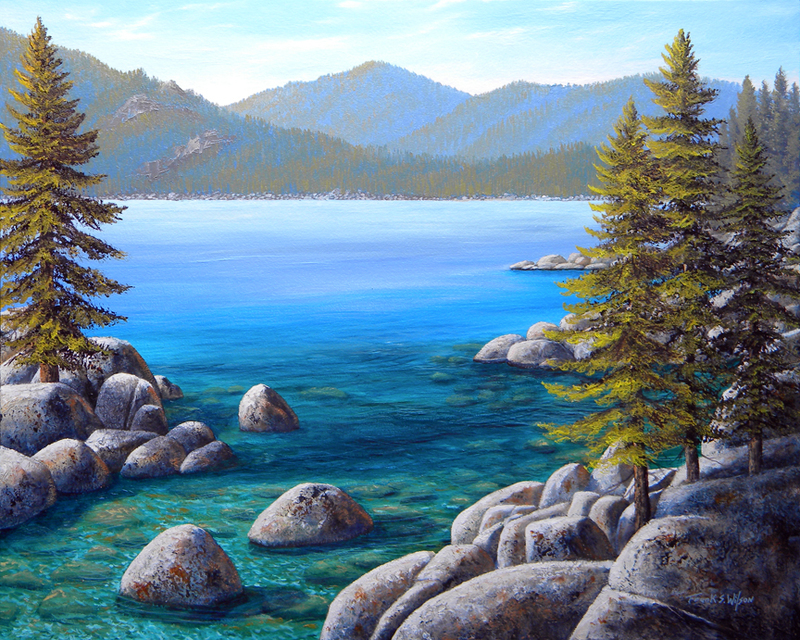 "Beyond Secret Cove Lake Tahoe"
16 x 22 inch oil painting on a frame-less 2 inch deep cradled hardboard panel with black sides. The original work is available for $1,600.00 from the Art Truckee Gallery in historic Downtown Truckee, California. 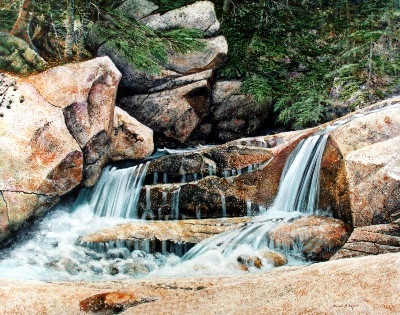 an original oil painting on a cradled hardboard panel 36" wide x 60" tall x 1.5" deep. 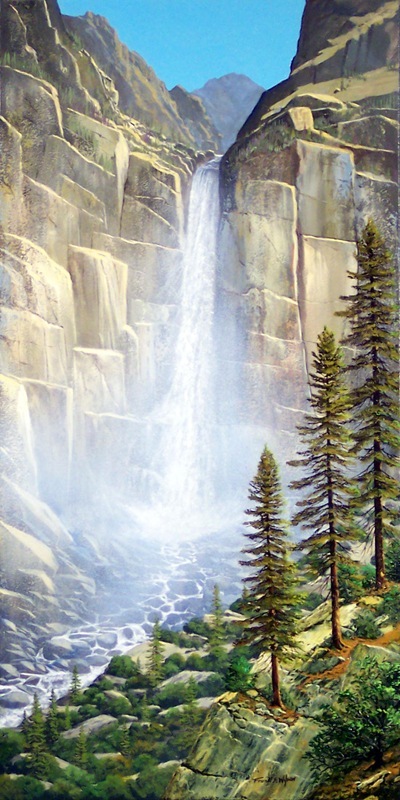 This original oil painting is available through the Art Truckee Gallery on Main Street in Historic Downtown Truckee, California. 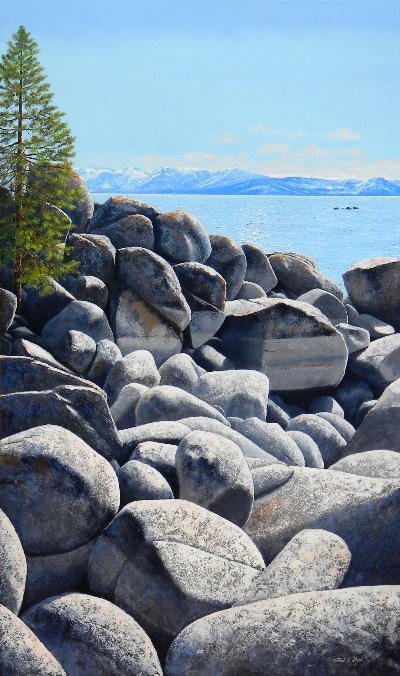 A limited edition of 70 full size giclees are available through the James Harold Galleries at the Boatworks Mall in Tahoe City, California. 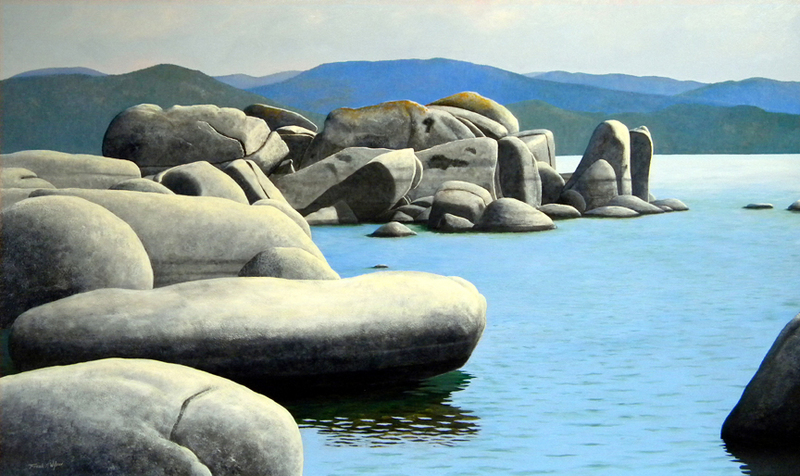 This highly realistic painting captures the giant, rugged, eroded, granite boulders on a certain part of the shore at Sand Harbor. Brilliant afternoon light illuminates the rocks, revealing their forms and their chaotic placement on the shore of Lake Tahoe. Snows from the previous winter still blanket the mountains on the opposite shore. This is an example of one of my "Landscape Portraits" ... paintings that capture accurately, every minute detail of a particular location. 36" x 60" x 2" an original oil painting on a cradled hardboard panel. Fine Art Prints are available on paper, canvas, acrylic and polished metal. Prints are available in several sizes on paper or canvas as well as greeting cards that you may customize. Click here. An original oil painting on a hardboard panel 30" x 48". The original painting is available through my studio. $5,600.00. Prints are available in several sizes on paper or canvas as well as customizable greeting cards. Click here. an original oil painting on hardboard 24" x 30". an original oil painting on hardboard 24" x 36". 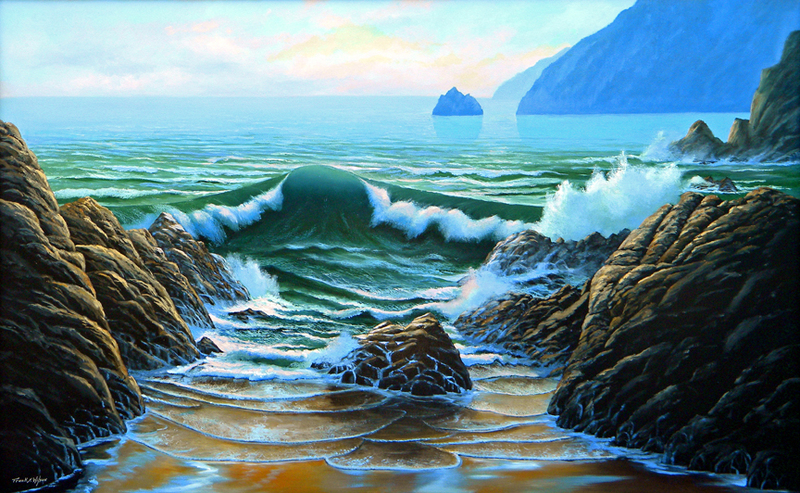 an original oil painting on hardboard 24" x 48". 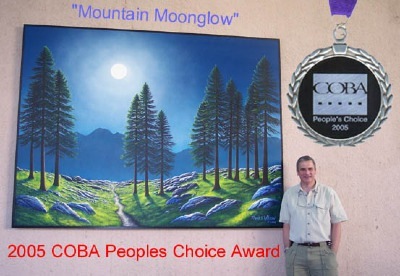 Frank Wilson with his award winning mural, "MOUNTAIN MOONGLOW", that can be seen in Downtown Chico, California on the side of the Artifacts Building East Third Street. The mural was a commission from the city of Chico in 2005 after the public awarded Frank's entry proposal the "People's Choice Award", by voting ballot, from among 20 selected finalists from throughout Northern California. The wilds of nature, in all it's diversity, is the common denominator for this multi-talented artist. 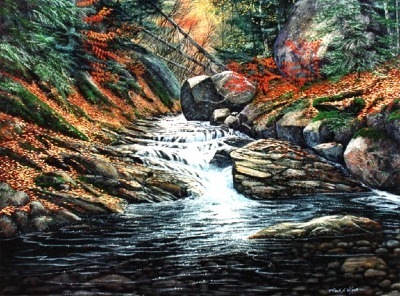 The hills and mountains in the wilderness areas of Northern New England and Northern California are the inspiration for his widely ranging work in both oils and gouache / watercolors. Frank also paints custom murals on canvas or hardboard for homes and offices both interior and exterior. Frank Wilson has always had a deep appreciation for natural beauty and a reverence for the natural world. 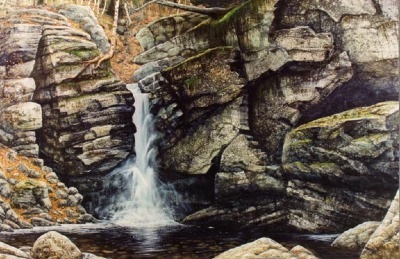 His passion is evident in each of his works whether a small watercolor study or a large canvas mural. Any painting seen on this site can serve as the basis for large canvas wall mural for your home office hotel or place of business. Murals created on canvas can be shipped anywhere. See "Murals" page. 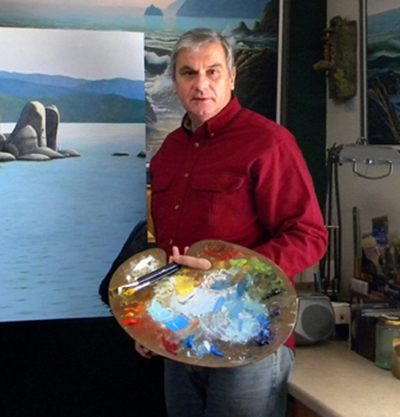 Frank S. Wilson has been a full time professional artist since 1971. 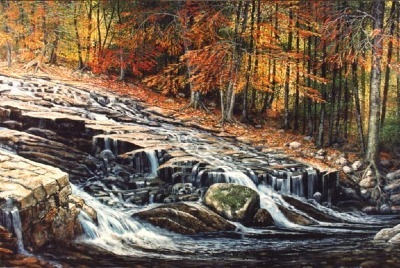 A prolific painter, Wilson has created over 3,000 highly detailed original works in oils and watercolors since 1995 in addition to hundreds of sculptures. His paintings are in private and corporate art collections in dozens of countries on four continents. In September of 2005 he was awarded the City of Chico California, COBA “Peoples Choice Award” and a commission for a large outdoor mural. In the spring of 2009 he was awarded two commissions for outdoor murals from Enloe Hospital in Chico California. His work has been featured in the New York State Museum, and in art galleries in New England, Virginia, North Carolina and California as well as in Zurich and Geneva, Switzerland. On October 9, 1998 Frank was a featured artist on ABC's nationally televised "Good Morning America" show. On January 23, 2009 Frank and his wife, Toni, were featured artists on a CBS Action News story.